The Old Korean Legation building is a meaningful space that has witnessed major events in both Korean and American history. It was a cradle for the Korea-U.S. friendship. The evening will end with Korean plum wine and other refreshments. Located on Logan Circle, northeast of the White House in Washington D.C., the Old Korean Legation building was erected in 1877 as the house of American Civil War naval hero, politician, and diplomat Seth Ledyard Phelps (1824–1885). After becoming the Korean Legation in 1889, the building provided a main stage for the active diplomatic endeavors of the Joseon dynasty (1392–1897) and Korean Empire (1897–1910) for sixteen years. This ended when Japan deprived the Korean Empire of its diplomatic sovereignty through the Japan-Korea Treaty of 1905, also known as the Eulsa Treaty, in November of that year. After the Japan-Korea Annexation Treaty of 1910, the Old Korean Legation building was eventually purchased for a mere $5 by the Japanese government and immediately resold. Korean ownership of the building that had been so humiliatingly extorted failed to be restored for decades, even after liberation from Japanese colonial rule in August 1945. It was only late in the 1990s that discussions for the restoration of this building began among Koreans living in the United States. This was followed by a diverse range of efforts within Korea and overseas. The Old Korean Legation building was finally returned to Korean hands in October 2012 when it was successfully repurchased by the Cultural Heritage Administration and the National Trust for Cultural Heritage of the Republic of Korea. The Old Korean Legation building is a meaningful space that has witnessed major events in both Korean and American history. It was a cradle for the Korea-U.S. friendship born out of the dedicated diplomatic efforts of King Gojong (r. 1863–1907), and a symbol of the drive for independence among Korean residents in the United States who gathered there to reaffirm their determination to recover the sovereignty of their motherland. It also provided a window for absorbing modern cultural elements from the West. 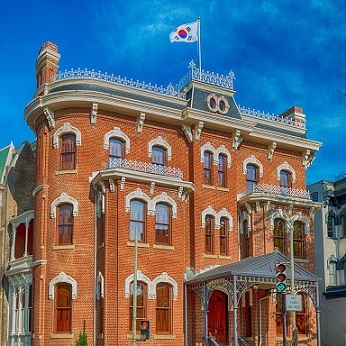 Today, the Old Korean Legation building is the sole example preserving its original appearance among the extant nineteenth-century diplomatic mission buildings in Washington D.C. and is highly valued for its historical significance. This photo shows Minister Park and his staff in Washington D.C. in 1888. The Old Korean Legation building sits in the Logan Circle neighborhood that was designated a Historic District in June 1972 and came under management by the National Park Service. The Cultural Heritage Administration and the Overseas Korean Cultural Heritage Foundation began the restoration of the building in December 2015 and opened it to the public in May 2018.